and Donghae (동해, literally "East Sea") in South Korea. References: ND 677 *gärdV 'encircle, surround, fence' (IE + Sem.?). References: ND 659 *ge(ʕV)rV 'to fence around, encircle; enclosed place'. 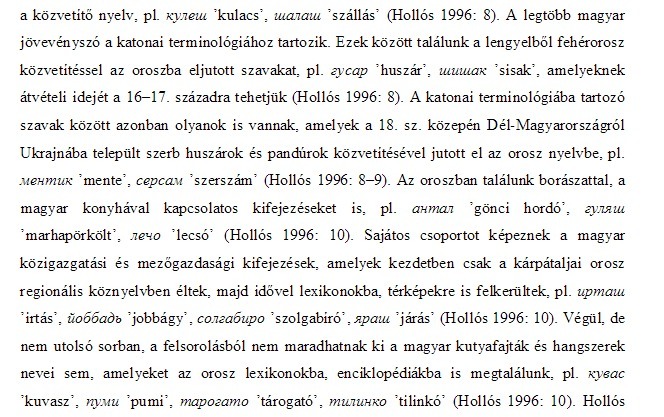 References: ND 2110 *sürV ~ *surE 'to rub, scratch' (+ dub. Drav. ; + Chad.). 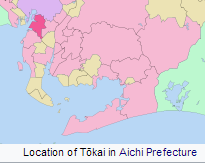 References: ND 365 *c̣iryV 'scratch/chisel' (Kartv. *ć̣er- + Alt. 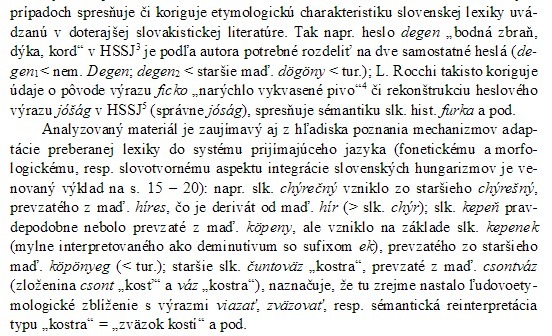 *č`iŕV + Kann. + ?Sem. *c̣ūr-/*c̣īr- 'fashion, shape'); ND 406 *č[i]GRV 'stop up, thrust' (Kartv. čxer- + Mong. čirɣa- + Sem.). Certainly more than one root, but hard to sort out. Comments: [But for PIE cf. also PA *sū̀re 'sour']. Esk.-Al. *civaʁa 'sorrel'. 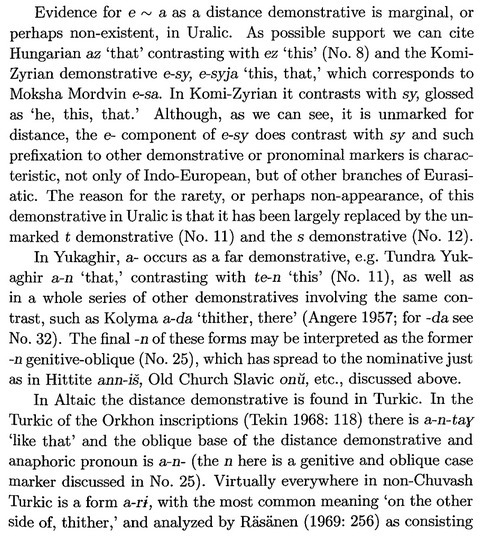 References: ND 363 *c̣uyrV 'rot, stink, be spoiled/bitter' compares Kartv. with Alt. *č`ire (see *č̣irV) and FU *ć[uy]rV 'bitter, sour' (which - if it exists - is a better match for Alt. 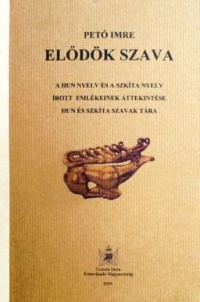 *či̯obeŕV and Drav. *śovar); ND 2113 *SuH/wErV 'sour, seasoned' compares IE *sūr-, Alt. *sūre and the same Ur. *ć[uy]rV. Obviously several roots. Comments: Other similar roots include: Kartv. *zeṗ- 'strike, thresh'; Drav. *cap- 'clap hands'; Ur. *sappV 'strike a heavy blow' (ND 2674); Alt. *sapV 'hit, throw', *ǯobá 'cut, crash'. 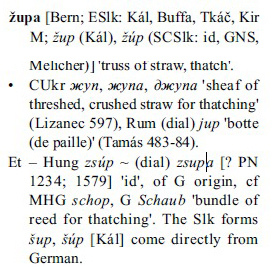 References: МССНЯ 361, ОСНЯ 1, 201; ND 347 *ć̣aP_V 'stalk, pointed stick, spear' (Alt.-IE), 351 *ć̣aṗ(ʕ a 'beat, strike, chop' (Alt.-IE-Drav. + Sem.). 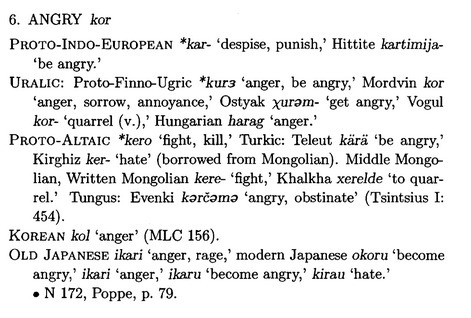 Uralic: *surmV; ObU *ćărǝk 'fest gedreht'? 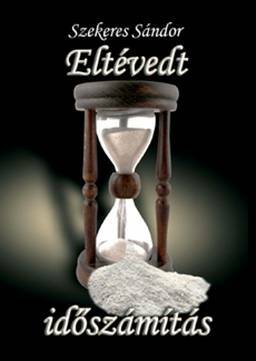 References: ND 462 *ĉUŕ[i] 'twist, twine' (Kartv.-Drav.-Ural. + Ethiop.). Middle Low German schope "ladle"
Middle Dutch schoepe "a scoop, shovel"
A megadott Old Chuvas és Mansi oldalak nem találhatók, sajnos nem tudtam őket megnézni. 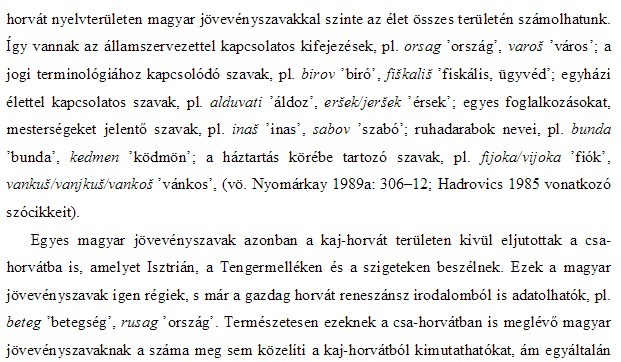 Az a véleményem, hogy az old Chuvas nyelv egy eltörökösödött magyarhoz hasonló nyelv is lehetett eredetileg! kölyök ‘whelp, young of an animal’ < *köläk. 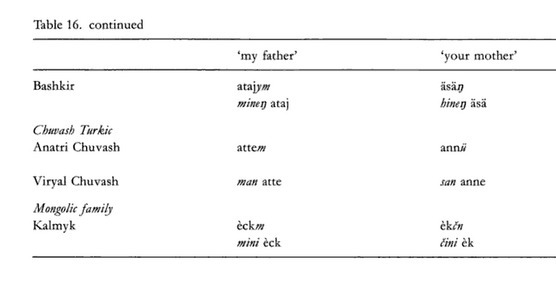 The early Kipchak source Codex Cumanicus exhibits [Mongolic] borrowings like abaɣa ‘uncle’, čïray ‘face’, ebäk ~ elpäk ‘very much’, yada‑ ‘to get tired’, qurulta ‘assembly, council’, manglay ‘forehead’, nögär ‘follower’, and qaburqa ‘rib’. Oldalt eddig 3068540 alkalommal keresték fel.